The fossil fuels that provide much of the world's energy orginate in a type of rock known as kerogen, and the potential for recovering these fuels depends crucially on the size and connectedness of the rocks' internal pore spaces. Now, for the first time, a team of researchers at MIT and elsewhere has captured three-dimensional images of kerogen's internal structure, with a level of detail more than 50 times greater than has been previously achieved. These images should allow more accurate predictions of how much oil or gas can be recovered from any given formation. This wouldn't change the capability for recovering these fuels, but it could, for example, lead to better estimates of the recoverable reserves of natural gas, which is seen as an important transition fuel as the world tries to curb the use of coal and oil. The process, a slow pyrolysis, involves "cooking oxygen and hydrogen, and at the end, you get a piece of charcoal," Pellenq explains. "But in between, you get this whole gradation of molecules," many of them useful fuels, lubricants, and chemical feedstocks. The study also reveals that the typical pore sizes in these formations are so small that normal hydrodynamic equations used to calculate the way fluids move through porous materials won't work. At this scale the material is in such close contact with the pore walls that interactions with the wall dominate its behavior. The research team thus had to develop new ways of calculating the flow behavior. "There's no fluid dynamics equation that works in these subnanoscale pores," he says. "No continuum physics works at that scale." To get these detailed images of the structure, the team used electron tomography, in which a small sample of the material is rotated within the microscope as a beam of elecrons probes the structure to provide cross-sections at one angle after another. These are then combined to produce a full 3-D reconstruction of the pore structure. While scientists had been using the technique for a few years, they hadn't applied it to kerogen structures until now. 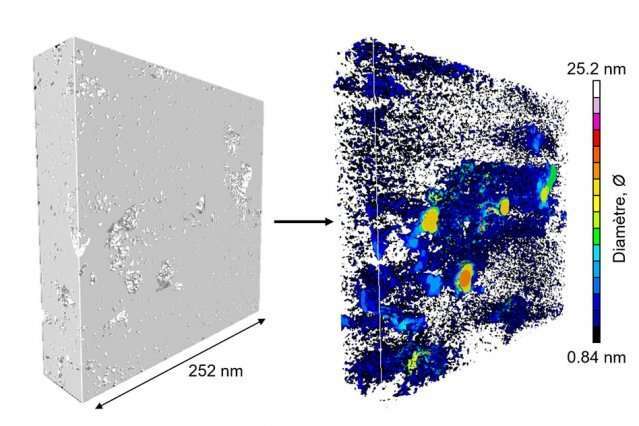 The imaging was carried out at the CINaM lab of CNRS and AMU, in France (in the group of Daniel Ferry), as part of a long-term collaboration with MultiScale Materials Science for Energy and Environment, the MIT/CNRS/AMU joint lab located at MIT. "With this new nanoscale tomography, we can see where the hydrocarbon molecules are actually sitting inside the rock," Pellenq says. Once they obtained the images, the researchers were able to use them together with with molecular models of the structure, to improve the fidelity of their simulations and calculations of flow rates and mechanical properties. This could shed light on how production rates decline in oil and gas wells, and perhaps on how to slow that decline. So far, the team has studied samples from three different kerogen locations and found a strong correlation between the maturity of the formation and its pore size distribution and pore void connectivity. The researchers now hope to expand the study to many more sites and to derive a robust formula for predicting pore structure based on a given site's maturity. Nice to see it up close, though ! !